When the baby is still very young, she can nurse as often as every 2 to 3 hours. That’s why baby carriers designed specifically to facilitate breastfeeding are favored by the majority of moms. By buying a baby carrier for breastfeeding, you are allowing yourself to enjoy the freedom of movement. You don’t have to frantically look for a place to feed your baby when it’s getting fussy. Since infants might ask for nursing at any time of the day, many moms are limited to their homes and malls. If you are an active mom, who likes spending hours going about her business, you need to find a way to feed your infant on the go. When choosing the best baby carrier for nursing, you need to consider a few factors. Let’s take a look. In order for the baby to feel secure inside the baby carrier, most of them are designed to allow a tight fit. However, you need to be able to stretch the fabric slightly in order to do breastfeeding. Look for carriers made out of stretchable fabric so you don’t have to fiddle with a bunch of buckles and clips in order to loosen it. Most of the bay slings offer a front carry position. However, there are backpack carriers that only allow you to wear the baby on your back. At the same time, some carriers might offer only outward facing front carry position, which is obviously not suitable for nursing. That’s why you need to make sure that the front (inward facing) carry position is available for safe breastfeeding. The best choice for breastfeeding is the carrier with a cradle position. It allows you to enjoy the natural breastfeeding environment. However, most babies feel comfortable feeding in a vertical position as well. When you have to feed your baby in public, you want to cover her up as much as possible in order not to expose anything private. That’s when extra fabric and covers can be of great help. While covers are not compulsory for even the best baby carriers for breastfeeding, they can substantially facilitate the process and give you a peace of mind. This purpose can be served by the long tails of a ring sling, the straps of the Mei-Tai carrier or a baby hood in the soft structured carrier. When the baby is nursing, it’s doing some hard work. That’s why many infants sweat while breastfeeding. If you live in a warm climate or plan to wear the baby in the summer, you need to consider lightweight and breathable fabric to make the infant more comfortable while breastfeeding. You breastfeed your baby for maximum a couple of years, however, a carrier can serve you until your baby is much older. That’s why you need to consider the versatility of the best baby carrier for breastfeeding. Will it serve you well after your goals change? Can the carrier be easily worn by the father? If one of the answers is “no”, you’ll probably need to look for a new carrier after you stop breastfeeding. Most of the time, you can’t feed the baby in the same position you are wearing her. You need to loosen the carrier slightly to free the breast and allow the baby to start eating comfortably. Carriers that are hard to adjust on the go are not suitable for breastfeeding purposes. You need to be able to easily loosen up the straps or waistband in order to start nursing without being worried about the baby’s safety. Babies who breastfeed tend to drool and posset. That is why the baby carriers require constant cleaning and washing. The best baby carriers for nursing should allow you to clean them as fast as possible. This means they should either allow for quick spot cleaning or for machine washing and drying. We came up with a list of 3 best baby carrier for breastfeeding that can help make your choice easier. Slings are probably the best baby carriers for nursing that you can find. However, the ring slings have a learning curve which might not be appropriate for parents with fussy babies who don’t like when it takes too long to adjust them. Peanut Shell Classic Baby sling offers all the benefits of a ring sling without the rings and the learning curve. The sling is very stretchy and it allows you to adjust it as much as you want to accommodate the baby when she is breastfeeding. This sling allows for cradle and front (inward) carry positions, both of which are suitable for comfortable breastfeeding of infants and older children. The fabric is 97 % cotton and 3 % spandex. It’s sturdy yet stretchable and can be machine washed. The sling is lightweight and compact. It can easily fit into a diaper bag. The carrier allows for completely discreet breastfeeding in the cradle and front carry positions. You can pre-tie the wrap in order to make putting the baby inside fast and easy. The sling comes in two sizes (small/medium and large/x-large). This allows the mom to choose the most suitable carrier for her size. The sling has soft padding to make the baby carrying convenient for mom. It allows you to carry the baby around for a longer time without the feeling of discomfort on the shoulder. There are three carrying positions (cradle, front (inward), and hip carry). They accommodate the smallest infants as well as the growing babies. This sling comes in a variety of beautiful fabrics that parents can truly appreciate. The sling is designed for babies, who weigh from 8 to 26 pounds. This means as your baby gets older and heavier, you need to buy another carrier. While this sling has a lower learning curve than the ring sling, it still takes some getting used to. This might be off-putting to some parents. The sizing of the sling means that if the two parents vary in sizes, the sling might not be suitable for one of them. Wraps are another great choice of baby carriers for breastfeeding. While they can take some time getting used to, they seem to have all the options necessary to provide safe and comfortable nursing for your baby. Boba Wrap is a versatile baby carrier that can accommodate both infants and toddlers. The baby can be carried in the cradle and inward facing hold. This can make breastfeeding easy for both infants and toddlers. The wrap is stretchy enough to make the breastfeeding simple without doing too many adjustments to the way the wrap is tied. The wrap is essentially a big piece of fabric. Once you tie the wrap and put the baby inside, you still have plenty of fabric to use as a cover when breastfeeding. The wrap is very compact and can be folded into a small pouch. The wrap is machine washable and dryer compatible. The wrap can be used for babies from 7 to 35 lbs. (3 to 16 kg). This means you don’t have to buy a new carrier until your baby is about 36 months. The wide straps of the wrap allow for comfortable wearing. The wrap offers great weight distribution, which helps you carry even a heavy toddler for long periods of time. The carrier comes in several patterns, so even the pickiest parents have plenty of options to choose from. The carrier comes at a moderate price compared to soft structured carriers available on the market today. The wrap is suitable for parents of all sizes, including petite moms and plus size parents. Just as any wrap, Boba has a high learning curve. Fortunately, there are plenty of tutorials available to make the learning process faster and easier. The big amount of fabric makes this wrap unsuitable for hot summer days. You need to buy a new carrier once your baby’s weight goes over 35 pounds. When you put the wrap on, the tails drag on the floor and may get dirty fast. The baby can only be carried facing inwards. As the baby grows older, she might not be comfortable when worn away from the world. 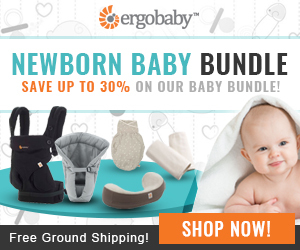 Ergo is a versatile baby carrier that can be used for babies of all sizes. It offers plenty of different features for both the mom and the baby. Besides being a great choice for toddler and older babies, an infant insert allows Ergo to accommodate the smallest children as well. The carrier offers simple and discreet breastfeeding making it one of the best baby carriers for nursing at home or on the go. This carrier offers a front carry option, which places the baby in a comfortable position for breastfeeding. The carrier comes with an adjustable hood that can make breastfeeding discreet and convenient. The carrier is lightweight (only about 2 pounds), which makes it easy to carry around even with the heavy baby inside. The carrier is suitable for children up to about 4 years old, which means you don’t have to look for a new carrier once the breastfeeding period is over. The carrier is machine washable and can be spot cleaned. The carrier is easy to adjust for fast breastfeeding access. The variety of colors Ergo carrier comes in and the simplicity of the design makes this carrier suitable for both parents. It also comes in a variety of fabrics, including organic cotton. The carrier is equipped with various pockets that can eliminate the need for extra bags to be carrier around with your baby. The baby sits in an ergonomic position. This allows for long walks and comfortable sleeping. International Hip Dysplasia Institute certified Ergo as a hip-healthy carrier. 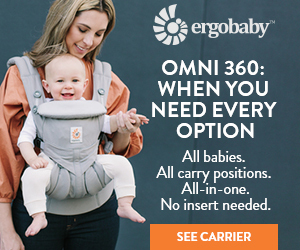 Due to the popularity of Ergo baby carrier, it’s widely available and can be purchased at various boutiques and online stores. The carrier can fit both petite and tall parents. It can be comfortable to wear for moms and dads from 5 to 6.5 feet. There is no cradle carry option. The carrier comes at a rather high price depending on the model you prefer. Infant insert is sold separately. The carrier might not be a perfect choice for babies who can’t support their heads yet.